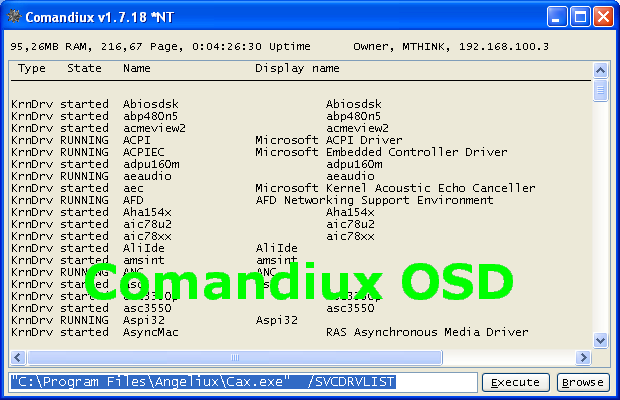 Comandiux is multipurpose command line controlled (cli) system utility. It enhances the standard Windows environment with many new features. Automates various activities and adds power to batch files. You can reboot, shutdown or log off windows session, kill task, create or modify a service. Destroy, hide or close any window. Calculate MD5 or SHA1 from command line. Eject or close drive and many many more. Either it needs a bit more instructions or it simply doesn't work. No matter what I enter, I only get an error popup that says 'the system cannot find the file specified'. If you're serious about writing powerful batch files, commandiux is a must-have utility. My favorite function is the on-screen display, OSD - you can specify plain text and RTF text, which means you can overlay winword-like, colorful text on your screen! I'm not aware of any other free utility that can do that. I also use it to control my monitor, screensaver and volume level. I start batch files invisibly, without seeing that ugly black DOS-box window. Commandiux can control windows, manage processes, list services and devices, and many more advanced functions. It's too much to describe here - you've got to try it. No installation needed, just run the tiny 100K exe, that's all. On my wish list: the ability to dump info to a text file instead of to its own window. Pros: small, powerful, unique functions that are hard to find elsewhere, no installation needed. Cons: needs more documentation with examples. very usefull, if u know what its for (on previous comments). U can simply control certain thinks, like shutdown timer, scripting (.bat files helper) and so on. lacking experience is perhaps a better word. most commandline tools fall under the category "if you don't know how to use it, you probably don't need it". I downloaded it.. It has no installer, it's a simple exe program. I'm still not sure what it does as even the website doesn't have a manual or examples. 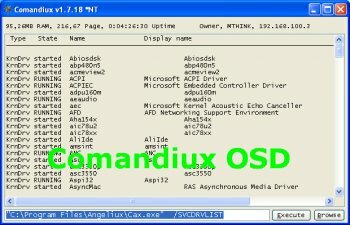 All that is included is the list of commands which show upon running the program. For the lack of documentation, I think I'll give it a two.